But the Nikon 1 AF is so blazing fast that I don't have to resort to antique methods LOL. AFAIK, Sony has introduced PDAF on one of their NEX cameras, and it's slow. And Canon's just released something using technology similar to the Nikon on-chip PDAF, so we'll see if the smaller CX sensor has in some way helped the V1 AF or if the technology can evolve to larger sensors. And that's the reason why I brought up the V1 in the first place, to counter perceptions that mirrorless/EVF cameras can't shoot action. My experience with the Nikon V1 is that this first generation technology is already faster and more reliable than my K-5. I certainly hope that Pentax is looking into similar technology, lest they fall even further behind the AF curve. At the end of the day, the V1's usability is quite poor for someone like me that is used to setting everything manually. If it had typically slow mirrorless AF.C I might have ditched it by now. But lightning fast AF is quite compelling, enough to keep me on board. For soccer moms and dads, fast AF may very well be the killer app. Hi, Is that a Honda NC700X? looks like it...I just got one a couple of days ago. I just got one a few days ago. I actually did it to go to more places to take pictures and enjoy the ride at the same time. Really excited to find one here . btw, how and where do you place your camera in order to take a pic like this? I will send a private message if I have more questions so I dont use the wrong thread for this. Whatever sensor they decide I hope we see a much faster & more accurate AF. A larger and brighter VF. I think the speed has now caught up Nikon. I've tried my K-30 out against a D7000 and there was no difference. MOst difference I noticed were in the lenses where my 18-135 was just as quick as Nikon glass and screw drive fast 50's were actually a bit bette in favour of Pentax (with in-body SR). AF tracking, that's better with Nikon IMO. Those predictive algorithms and sub-sensors are something Pentax desperately needs. How do you get a larger and brighter VF than 100%? They've given up magnification to get there and with a rear LCD and Live View 100% is where all DSLR OVF's should be with the option of a further magnifier like the O-ME53. That may be. I still have the K-5 and it can't track a 7 week old puppy that can't even run yet. Coverage doesn't have anything to do with brightness. I can change screens and get a brighter VF. I list upgrades to the AF as the #1 technical issue for Pentax, above even FF. This has long been the Achilles' Heel of the system, sadly continued with the K-500 and the loss of focus indicators. Terrible, brand-wrecking penny pinching. F/9.5 with a 58mm lens is going to yield a a huge DoF with APS-C. Shoot that at F/2.8 and see how many you get. 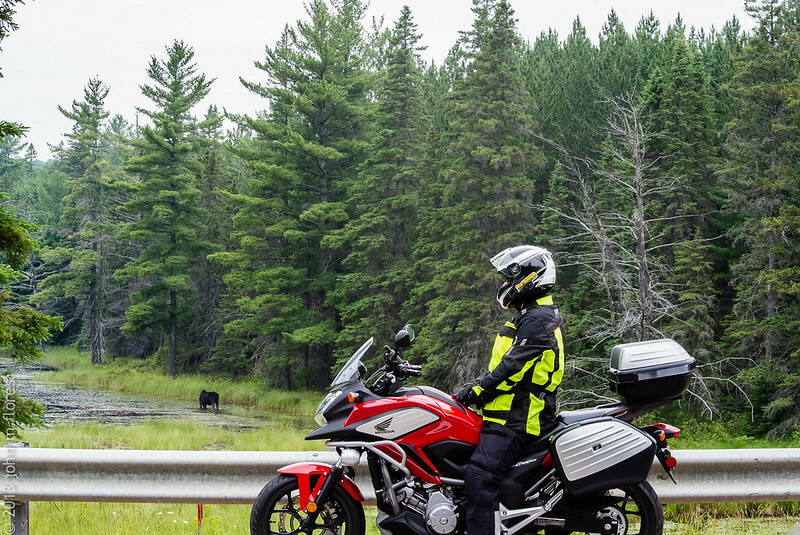 I had the NC700x for a story I was doing in Ontario. Fun little thing; I enjoy bikes that you can cane and whip on the street WFO, much more involving than the uber-powered bikes. Regarding how to get that first shot. You've got to rig up a mounting system that puts the Q over your shoulder. Set the intervalometer, ride like the wind, and hope you get something. I'll often mount on my body vs the bike; the body absorbs bike vibration. It was a brilliant Sunny day so shutter speed of 1/1500 to stop action & aperture around f8, the sweet spot of most lenses. I was concerned only with the dog. The lens was a 50-135 SDM. But okay, here's a 2.8 example. Low tungsten light so ISO 6400. Same 50-135 SDM at 135 & K-5 body. I tracked her the same as the dog. Both great shots.. makes me want to grab another 50-135, especially since Pentax now has a two year warranty in OZ. This is good news. Someone should tell camera retailers though, as all that I've looked at recently still say 1 year. Thanks for the information and taking the time to reply. "Moore's Law" (over 12 million hits on Google) is a term that identifies technology and industry trends recognised worldwide over decades. If you are denying what is described by the Wikipedia article, the onus is on you to provide the evidence and analysis for your case. If you are claiming that these established trends in electronics don't apply to electronic viewfinders, again the onus is on you to provide the evidence and analysis! (The year by year improvements in EVFs are compatible with Moore's Law, and obviously haven't stopped). See "Why Moore's Law Applies to Photography". Perhaps you have a response to that article? You just lost any credibility. Bye bye. Sorry, Barry, but it's you who must explain in which way the Moore's "Law" applies to EVFs, and show us some data to prove it. Your way is called shifting the burden of proof, and it's not acceptable. You could start by specifying which characteristics are doubling every 2 years, so we'd know what to look for. "Moore's Law" (over 12 million hits on Google) is a term that identifies technology and industry trends recognised worldwide over decades. You just lost any credibility. Moore's Law is a topic which could fuel the discussions of an entire forum. You are both oversimplifying things. Of course, there is no such law as Moore's. However, it is a heuristic rule which prooved true over stretched periods of time in the past. It is still somewhat applicable when it comes to feature sizes. The most obvious breach of the rule is the 3 GHz barrier which processors reach but refuse to cross since 2002 (the Northwood Pentium 4). As for EVFs ... A high contrast and high resolution EVF has to be a larger chip than the current generation uses to be (they use minuscule chips). Already for its contrast abilities. It is like sensor size: if a chip which is coupled to an optical system is too small then there are problems which are expensive to solve. So, future high end EVFs will use large chips which will both bring betetr resolution and better contrast. Current technology can already do this. But it won't be cheap and Moore's law won't help. However, progress in OLED technology will.